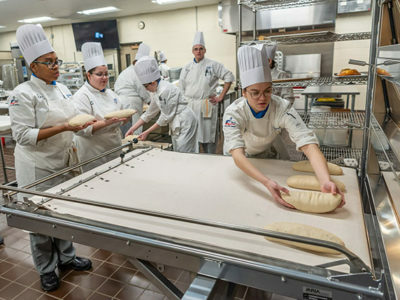 Thirty-eight Pennsylvania College of Technology students have been selected to cook for thousands at the 141st running of the Kentucky Derby on May 2. Known as “the most exciting two minutes in sports,” the tradition-steeped Kentucky Derby attracts more than 150,000 guests, including its fair share of celebrities. At Churchill Downs, students will spend a week helping to mix, chop and cook thousands of pounds of ingredients that they’ll serve to guests in suites and luxury boxes throughout the facility, including The Mansion, a lavish, invitation-only venue. Students are also assigned to the main kitchen, Jockey Club Suites, Turf Club Lounge, Finish Line Suites and the Plaza Balcony. In addition to cooking for the main event, several students will prepare food for “Dawn at the Downs,” a popular Louisville tradition that gives visitors an opportunity to enjoy breakfast in Millionaires Row while watching the Kentucky Derby and Kentucky Oaks contenders conduct morning workouts. Penn College students Brianna R. Helmick, a culinary arts and systems student from Hershey, and Eileen N. Harrington, of Etters, who received an associate degree in hospitality management and is continuing her studies toward a bachelor’s degree in technology management, pause above the iconic Churchill Downs track during the 2014 Kentucky Derby. Representatives of Levy Restaurants, which provides food service at Churchill Downs and other sports and entertainment venues throughout the country, visited campus in February to interview student applicants. In addition to Mach, the students will be accompanied by Chef Charles R. Niedermyer, instructor of baking and pastry arts/culinary arts. Marci L. Cohen, of Clarks Summit; Shannon E. Croney, of Lake Ariel; Kirsten E. Foti, of Landing, New Jersey; Katlyn J. Hackling, of Lake Hiawatha, New Jersey; Brittany L. Mink, of Allentown; Rebecca L. Rizzo, of Palmyra; and Dylan H. Therrien, of Reading. Magdalen C. Bennett, of Erie; Arden F. Campbell, of Lebanon; Amy M. Decker, of Halifax; Jessica N. Felton, of State College; Sarah B. Fiedler, of Lock Haven; Wyatt F. Fink, of Cogan Station; Jaclyn C. Gregg, of Warriors Mark; Jenna E. Haas, of Lancaster; Cy C. Heller, of Milton; Brianna R. Helmick, of Hershey; Daniel A. Horst, of Harrisonburg, Virginia; Patrick J. Kelly II, of Muncy; Rebecca L. Klinger, of Cogan Station; Darren J. Layre, of Hatboro; Alissa R. Martz, of Danville; Lyndsay E. Maynard, of Fleetwood; Rachel A. Mertz, of Paxinos; Alyssa J. Morales, of Williamsport; Stephanie C. Myers, of Catawissa; Ashley R. Post, of Orwigsburg; Kendra J. Riggle, of Montoursville; Kassandra S. Sellinger, of Linden; and Dallas A. Tyree, of Stillwater. Kathryn R. Knause, of Catawissa, and Katelynn M. Watson, of Milton. Andrea K. Irvine, of Towanda; Emily K. Lutz, of Wading River, New York; and Seth A. Ruch, of Linden. Elizabeth M. Hiller, of Honesdale; Victoria L. Kostecki, of Center Valley; and Danica C. Mazzotta, of Tyrone. To learn more about hospitality-related majors at Pennsylvania College of Technology, call 570-327-4505. For more about Penn College, visit Penn College, email the Admissions Office or call toll-free 800-367-9222. Congrats all and have a blast while representing Penn College! Keep an eye out for Bobby Flay on Friday especially (horse owner himself and usually owns more fillies than colts), and bet an exacta and trifecta box American Pharaoh, Dortmund, and Mubtahiij in the Derby on Saturday!